30,000 Island Cruise Line Inc.
All aboard the new 40-passenger Islander in Parry Sound for a cruise to Huckleberry Island where a naturalist from the Georgian Bay Biosphere Reserve (GBBR) will lead students in an outdoor-based learning activity. Over 25 “Lessons- in -a- Backpack” have been created based on Ontario curriculum guidelines and reflect what is readily observable among the 30,000 Islands of Georgian Bay. The Lessons-in-a-Backpack program was developed alongside local school boards and offers students hands-on learning experiences. 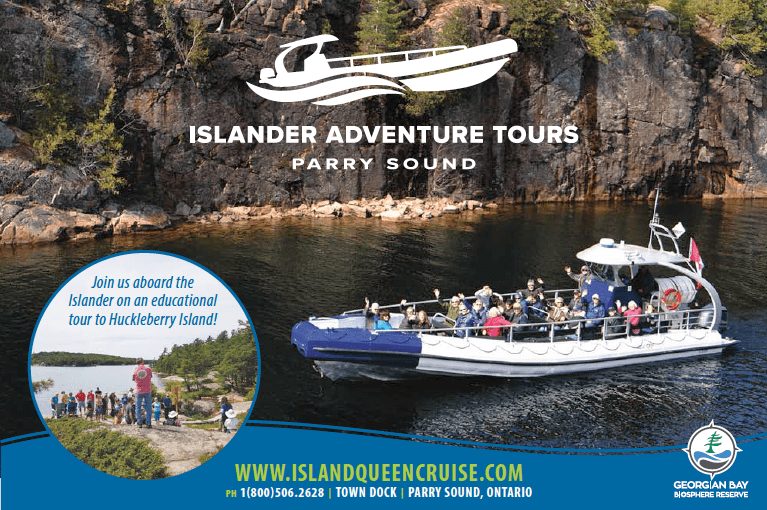 The 30,000 Island Cruise Line and the GBBR have partnered to bring you this new field trip option! Roughly 3 hours long with 2 hours on Huckleberry Island.